With the calendar now turned to December, the hockey season is in full swing for nearly every reputable league. From the NCAA to the KHL, the majority of teams have double digits in the games played column. For Minnesota Wild prospects and draft picks around the world, now is the time to show their capabilities, especially given that there will be more roster spots available on the Iowa Wild squad in the next few years as they continue to rebuild. The 19-year-old Russian winger is off honing his skills in the KHL and has been impressive in doing so. Playing against men, Kaprizov, a 5th round pick in 2015, has amassed 13 goals and 14 assists in 34 games while playing for a significantly more competitive team in Salavat Yulaev this season. Remember, this guy was taken #1 overall in the 2014 KHL Draft, so it’s not completely preposterous to think he’ll challenge for a roster spot soon. One of the few prospects under the Minnesota Wild umbrella who is NHL ready, Greenway is on or above a point-per-game pace. He has six goals and seven assists in just 12 games for Boston University. The 6’5, 230 lb power forward has embraced his role as a team leader this season and understands the need to take his game to a new level. This year’s first round draft choice continues to build on a stellar freshman campaign for the Wisconsin Badgers. His description as a highly skilled scorer has been spot on so far this year. His seven goals in 12 games lead the team and he will continue to be counted on to find the twine playing in front of a porous Badgers defense. In addition to being the most potent scorer on the roster, his leadership qualities are vastly underrated as he was named the team’s captain despite being 18 years old. Once considered a lock to go in the first round, Sokolov regressed last season and as a result plummeted down the draft board before being taken in the 7th round by Minnesota. 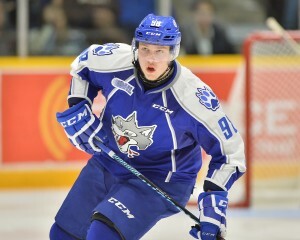 After playing last season on an atrocious Sudbury Wolves squad, Sokolov has regained his scoring touch while playing for a vastly improved team. His 16 goals in 23 games lead the team, although his minus-13 rating is a team worst. It seems like the Russian is a scoring machine and nothing more. This is your classic “diamond in the rough” candidate. Belpedio regressed somewhat in his sophomore season with Miami University as the RedHawks were uncharacteristically bad, missing the NCAA Tournament for just the second time in 11 years. This year, he was named captain and has bulked up to 200 lbs, although he has been unavailable for over a month, he had six points in seven games and was named NCHC Defenseman of the Week in the time leading up to his injury. An Eden Prairie, MN-native, Seeler has become the de facto enforcer for the Iowa Wild. His 46 PIM leads the team and he has no points in 16 games, but he is throwing fists at every opportunity. Splitting time with Alex Stalock in Iowa, Michalek has put up a pedestrian stat line so far this season. His 3.28 GAA and .912 SV% is weak, but again, Iowa is no powerhouse in the AHL. At least playing time has been more plentiful this year for the 23-year-old Harvard product. At 20 years old, a change of scenery would do wonders for the 4th round Finn. He plays for the worst team in the top league in Finland, although he is holding his own playing in 14 games to the tune of a 2.43 GAA and .910 SV%. Although at such a ripe age, the fact that he’s the starter on any of these teams is extremely impressive.